Steve Harmison will not be going on England's tour of Zimbabwe. The Durham paceman informed England management of his decision after the ICC Champions Trophy win over Sri Lanka at the Rose Bowl. But he told the News of the World: "In all honesty, my decision was made in Cape Town over 18 months ago. "England's World Cup squad spent an horrendous four days before finally deciding not to go to Harare. Nothing has changed for me." The England and Wales Cricket Board confirmed earlier this month that the team would play five one-day internationals in Zimbabwe, the first on 26 November. Harmison's decision could lead to other players opting out of the tour. In July, the News of the World claimed as many as seven players did not want to make the trip. And the ECB has made it clear that no action will be taken against any player who refuses to tour Zimbabwe. "The ECB has previously stated that any player who makes himself unavailable to tour Zimbabwe for reasons of personal conscience will not be penalized and this remains our position," said a statement confirming Harmison's decision. 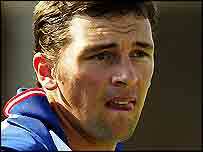 Harmison said he did not want to let captain Michael Vaughan or coach Duncan Fletcher down. But he added: "I don't believe my decision will cause any splits or break up this team. Most of the players will go. A second team would beat Zim anyway. No big deal. "What we've built is special and strong and 10 days in Zimbabwe isn't going to destroy or damage that. Harmison continued: "Being a personal decision, I realise I could be the only player who doesn't go. "I hope nobody questions my commitment. Being part of this team means so much to me." Harmison is not the first player to refuse to play in Zimbabwe - Australian spin bowler Stuart MacGill boycotted a tour earlier this year. MacGill said he could not go there and "maintain a clear conscience". The situation in Zimbabwe has been making back page headlines since before the 2003 World Cup, which they co-hosted with South Africa and Kenya. Zimbabwe team-mates Henry Olonga and Andy Flower staged a black arm protest at their game against Namibia, a symbolic gesture which they claimed was intended to "mourn the death of democracy" in their country. England, meanwhile, refused to play in Harare during the tournament following lengthy discussions between the ECB, players' union and the International Cricket Council. 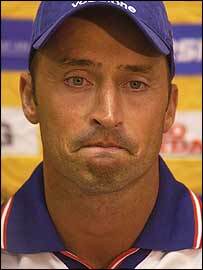 It prompted then skipper Nasser Hussain to accuse the ICC of letting the players down. Earlier this year, ECB chief executive Tim Lamb said he had received a letter from Foreign secretary Jack Straw which was "tantamount to an instruction" not to tour Zimbabwe in November. But they later accepted the tour would have to go ahead because of the threat of severe financial penalties and a possible ban being imposed by the ICC if they did not fulfil their touring obligations. At the same time, Zimbabwe cricket was torn apart by a dispute between a group of 15 white players and the country's cricket union which followed the sacking of national team captain Heath Streak. Zimbabwe were forced to field a side of inexperienced youngsters, resulting in the ICC restricting them to one-day internationals for the rest of the year to protect the "integrity" of Test cricket. The so-called 'rebel' players accused the ZCU of racism and a three-day hearing into their allegations is due to begin in Harare on 29 September. Academy: What makes Harmison such a special bowler?